This summer several movies are moving along on their road to the Oscars, while others are falling away. Summer may seem far from award season prime time, but this was a busy week for awards watchers. Distributors and Oscar campaigners are already pushing out new movies and positioning them for slots on the awards calendar. How they did ranged from impressive to fairly dreadful. Here’s a look at how it shook out. Director Matt Reeves hosted the first unveiling of his “Dawn of the Planet of the Apes” follow-up, the third in the blockbuster series starring Andy Serkis as sentient ape leader Caesar. It took Reeves and VFX master Joe Letteri and his Weta team three years to execute this elaborate epic that continues to follow wily Caesar and his apes as they fight against extinction by humans in a wintry North American landscape. A VFX nomination looks likely as Serkis and the sprawling ensemble are motion-captured live on set, rendered as a myriad variety of apes, and seamlessly mixed as live and digital elements, riding on horseback, climbing rocks and trees, exchanging fire with human soldiers, and diving through waterfalls (the splendid large-scale waterfall is CG). Adding inclement weather conditions increased the degree of difficulty for the VFX artists, along with lingering close-ups of Serkis as the weary, grieving Ape King on a quest to find the human Colonel (Woody Harrelson) who has wreaked havoc on his tribe. Harrelson didn’t know what to expect and found himself in an onset lengthy face-off with Serkis — while action sequences are carefully storyboarded, mocap allows for improvisation. 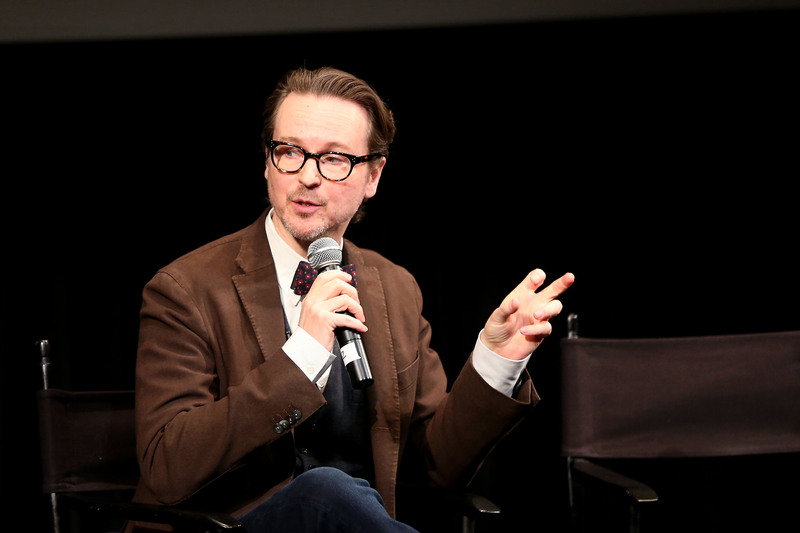 Reeves works closely with Weta on fine-tuning mocap performances and even does reshoots with his actors to pull out emotional moments. Another likely Oscar nomination: Michael Giacchino’s soaring score, which carries us through stunning natural vistas and brutal warfare as well as intimate emotional moments, as “War for Planet of the Apes” moves from war movie to prison-escape adventure and survival epic. 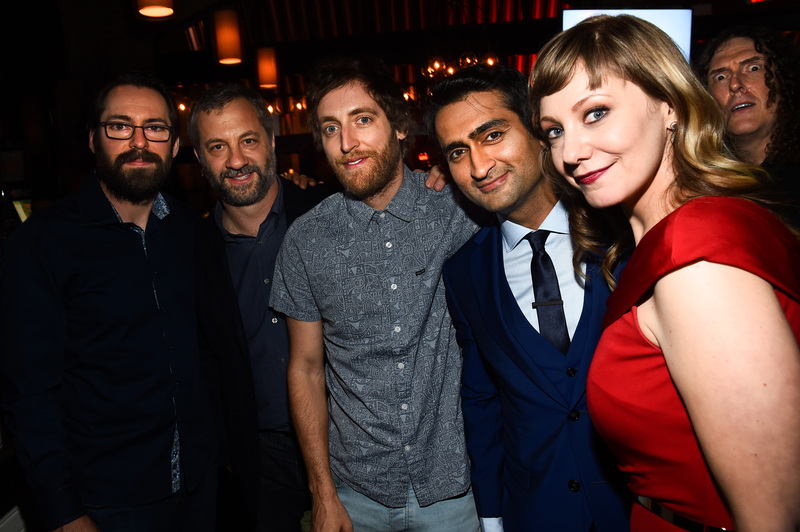 Martin Starr, Judd Apatow, Thomas Middleditch, Kumail Nanjiani, Emily V. Gordon, and Weird Al Yankovic at ‘The Big Sick’ film premiere. Producer Judd Apatow and director Michael Showalter’s Sundance breakout “The Big Sick” played well at L.A.’s premiere at the Cinerama Dome, introduced by autobiographical co-writers Kumail Nanjiani and Emily V. Gordon, who tell their true romance in the dramedy. Best Actor candidate Nanjiani is funny and moving as himself in the often-poignant film, well supported by Zoe Kazan as Gordon and Oscar-winner Holly Hunter (“The Piano”) and TV star Ray Romano as her parents. Depending on how far the movie goes, all are Supporting Oscar contenders, along with Original Screenplay. 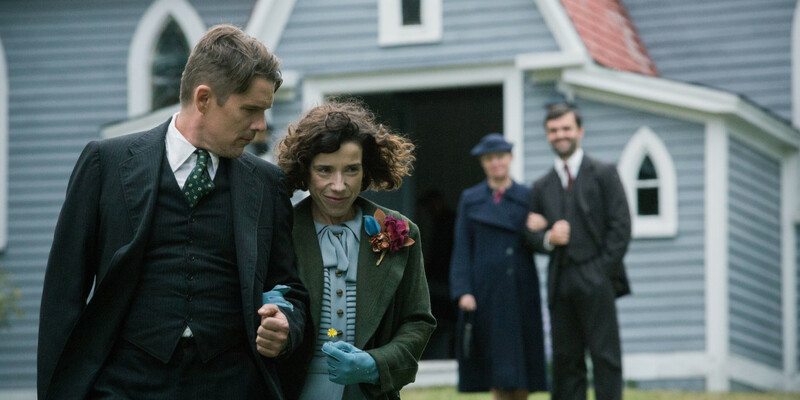 Veteran Irish film and TV director Aisling Walsh pushed through this true relationship drama (romance is not the right word) about a twisted, arthritic primitive painter (Sally Hawkins) who becomes the housekeeper for a reclusive, angry fishmonger (Ethan Hawke) in ’30s Nova Scotia. After she moves into his tiny hut, they get married and eke out a barebones living until her paintings start to sell. Shot in Newfoundland, “Maudie” debuted at Telluride last year and has been building a rep as a four-hankie tearjerker. Both Hawkins’ and Hawke’s extraordinary physical and emotional transformations will play well for the Academy actors branch. At Cannes, the Weinstein Co. showed buyers footage from “The Current War,” starring Benedict Cumberbatch and Michael Shannon as dueling egghead entrepreneurs Thomas Edison and George Westinghouse, and the American remake of Cesar-winning French hit comedy “The Untouchables,” which stars Bryan Cranston as a wheelchair-bound rich man and Kevin Hart as his unlikely rebellious aide, who is supervised by the tough Nicole Kidman. 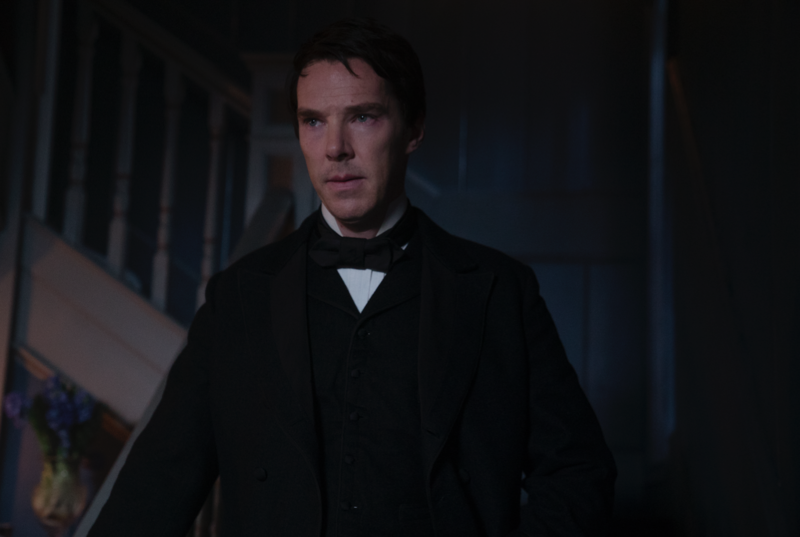 “The Current War” is now set to open December 22, at the height of Oscar season, and while footage for “Untouchables” was hilarious and the movie looks hugely commercial, Weinstein has taken it out of awards contention by booking it in 2018. Clearly no longer in the awards discussion is the LAFF opener from Colin Trevorrow. 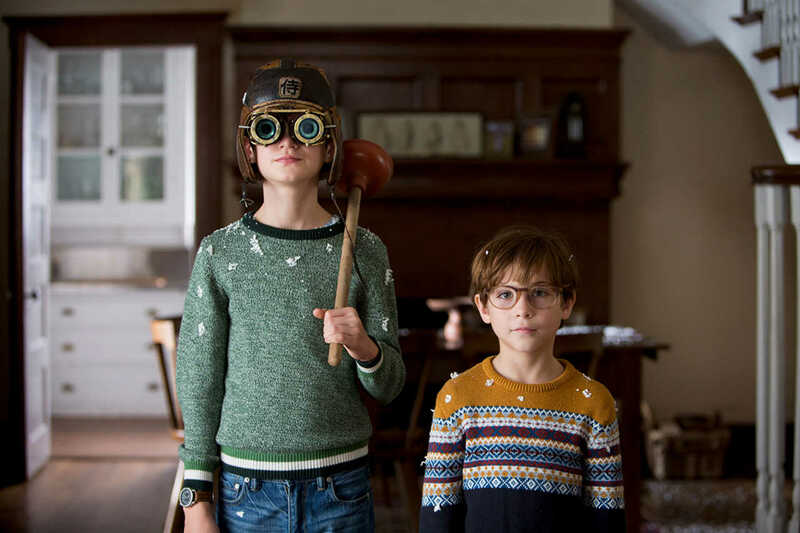 Feathered fish “The Book of Henry,” based on a 20-year-old screenplay by Gregg Hurwitz, is a messy melange of genres that stars Naomi Watts as the waitress mother of two boys, one prodigally smart. This unlikely heroine mom tries to expose the widower police commissioner next door for abusing his stepdaughter. The movie lurches from sweet family comedy to child-cancer drama to thriller, but is too mainstream to appeal to the arthouse crowd and too confusing and weird to play mainstream. The critics piled on Trevorrow, who will now seek redemption with his assigned “Star Wars” installment.